Deer about to feed alongside highway 107, south of Tomahawk. Deer are definitely at the top of the list of animals that people love to see while enjoying the Northwoods. In this week's episode of Wildlife Matters, the Masked Biologist talks about deer, specifically deer fawn behavior this time of year. I have been noticing a lot more deer moving around during daylight hours lately. We typically consider deer to be crepuscular, meaning most active at dawn and dusk. There are plenty of other factors that influence behavior, though. For example, they might be trying to feed during the day because the mosquitoes have been so intense. Or, as is often the case this time of year especially, it has to do with the fawn drop. Deer breed in the fall, typically from late October into early December, depending on when the individual female (doe) comes into estrous, or physically ready to reproduce. The pregnant doe carries the fawn through the winter and gives birth in spring. As the breeding window is somewhat spread across about two months, so is the birthing window. When the fawns are first born, they are not fast, nimble creatures like mom. This makes them a vulnerable target for the first two or three weeks after birth. They have three main methods of defense during this time. First, they have spots on their coat, which help provide camouflage when lying in the grass. Second, they lie almost completely motionless, even when danger is imminently close. Third, they lack scent almost entirely, since sense of smell is a primary method many of their predators use to hone in on their prey. Finally, to bring this all together, their mother has to remain at a distance most of the time. She has to come back to the fawn to allow it to nurse from her, but otherwise she will usually feed or loaf some distance away to avoid drawing attention to her fawn. These defenses may not be terribly effective against all danger. For example, even though they have virtually no scent, they can be effectively preyed upon by black bears. This is because bears have an unbelievable sense of smell, and they can smell the mother’s milk curdling in the fawn’s stomach. Lying still may be effective if a predator is looking for movement, but it can get you into trouble with vehicles and large mowers. I have seen fawns that were dropped and left unattended on roads and shoulders, which ended badly for the fawns. Even in excellent cover, being left unattended is also not a great strategy if a well-meaning human finds the fawn, fears it abandoned or orphaned, and picks it up and takes it. If you find a fawn lying alone, motionless in the grass, what should you do? If you are like my mom, you take a picture first. Fawns are typically lying sort of curled up, belly down and back up, holding their heads close to the ground. 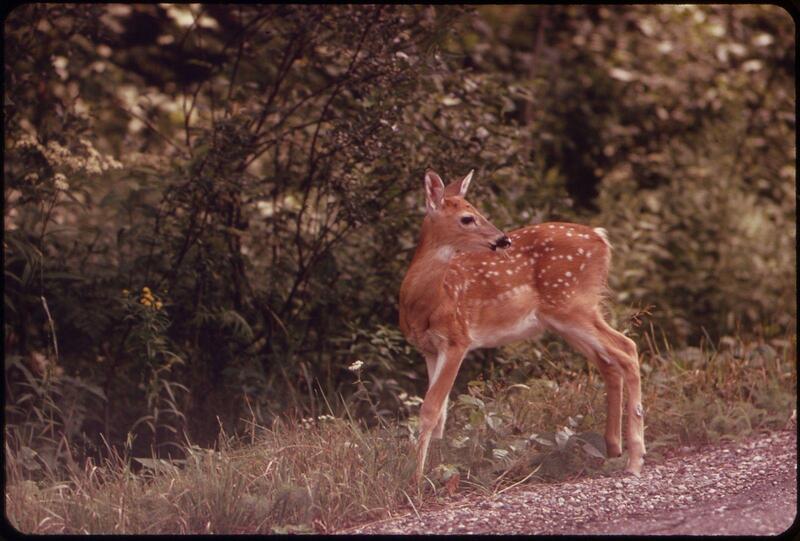 If you see a fawn lying silent and motionless in this position, and it does not appear injured or sick, you should leave it alone. In most cases, the mother is not far off, and will return to tend it when she deems it appropriate. If the fawn appears injured or sick—it might be bleeding, or lying on its side, or making loud bleat sounds for extended time periods (an hour or more) the fawn may be in trouble. In cases like these, it is best to note the location and contact your local wildlife rehabilitator. You can find a wildlife rehabilitator directory on the DNR website. In Oneida County, we are fortunate to have two wildlife rehabilitators—Wild Instincts in Rhinelander (715-362-WILD) and Northwoods Wildlife Center in Minocqua (715-356-7400). These folks are great to work with, and very knowledgeable. In fact, when I have a question about an animal injury or behavior that I can’t answer, I have Mark Naniot from Wild Instincts on speed dial. When in doubt, leave the animal where it is, make a call and ask first. These rehabilitation centers often have extended hours this time of year and can help you decide what is best for the animal.